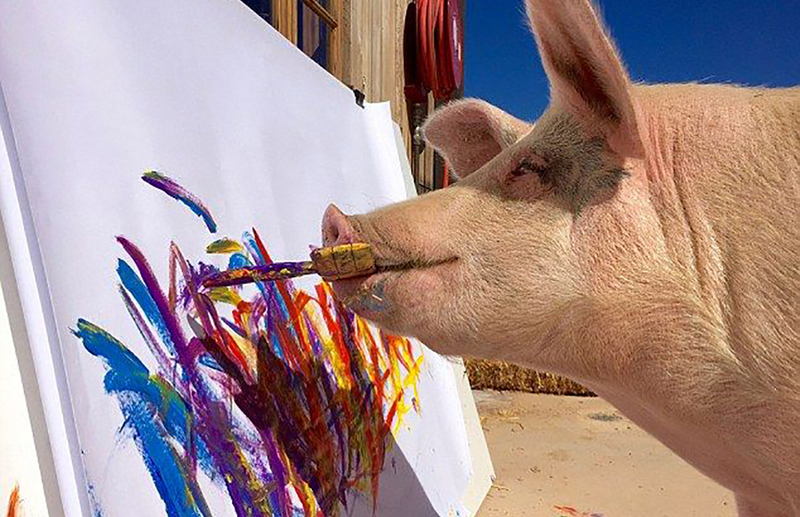 If you ever find yourself visiting the animal sanctuary in Franschhoek, in South Africa’s Western Cape, you may see Pigcasso with a paintbrush in her snout, marking up a canvas with bright colors in her sty. Pigcasso was rescued from a slaughterhouse when she was just a piglet in 2016. It didn’t take long for her new owners to realize that she was drawn to colors and was interested in paint brushes. Joanne Lefson, who runs Farm Sanctuary SA, noted that “Pigs are very smart animals and so when I brought Pigcasso here to the barn, I thought how do I keep her entertained?” They tried all kinds of activities such as playing with soccer balls, rugby balls, and more, but nothing seemed to interest her. She would also eat and destroy everything in the barn except for the paintbrushes lying around since the barn was fairly new. It wasn’t long before the sanctuary had her set up with her own painting supplies and Pigcasso began making her own mark on canvas. Her paintings have sold for upwards of $4,000 with all of the proceeds going to animal welfare. One of her paintings was even taken by the Swiss watch company Swatch and used for a face on a series of watches.